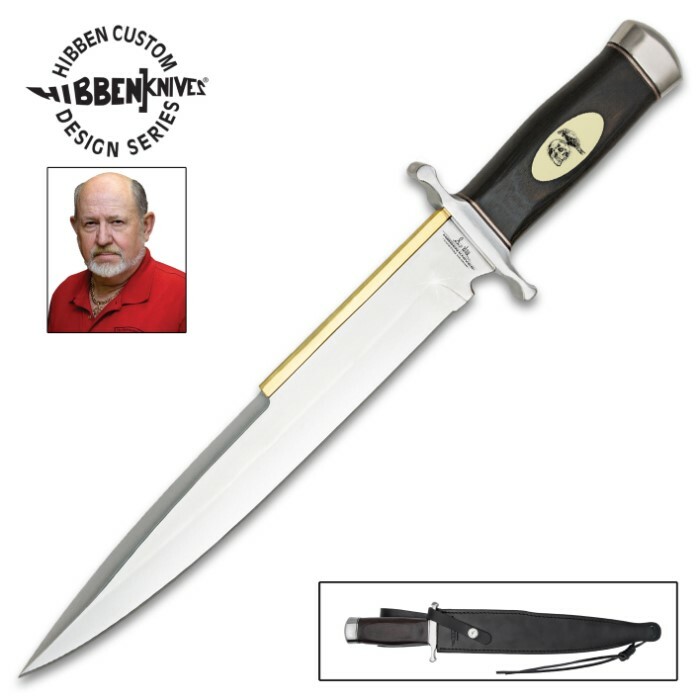 Gil Hibben "Expendables 2" Toothpick Knife And Leather Sheath | BUDK.com - Knives & Swords At The Lowest Prices! 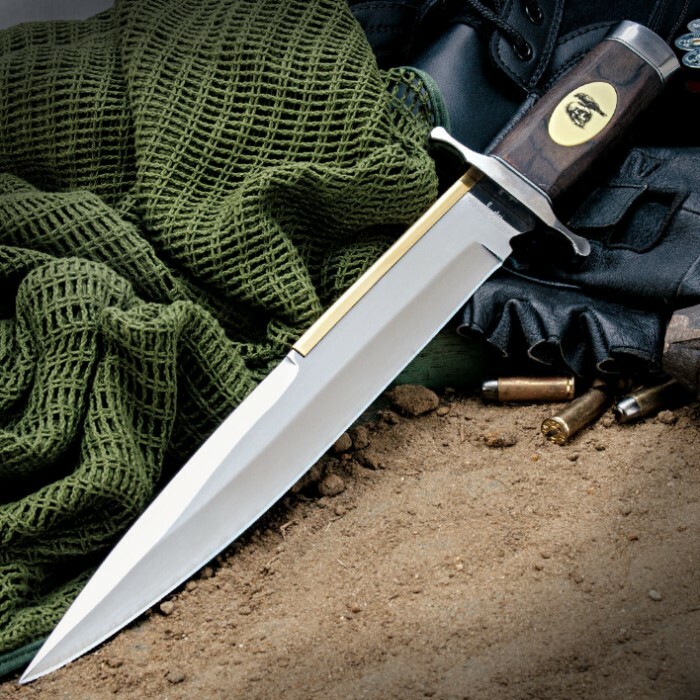 Gil Hibben has a history of designing knives for Sylvester Stallone to feature in his films, going back to the "Rambo III" Bowie. Stallone has been an avid collector of Gil's custom knives, and that relationship continued when Stallone commissioned Gil to make several knives to use in his new films, "The Expendables" and "Expendables 2." One of those was this never before produced, custom designed Old West Toothpick. It offers a classic 11 7/8" Arkansas toothpick style 3Cr13 stainless steel blade with a mirror polished finish and a solid brass spine plate. The wooden handle features an elegant synthetic ivory inlay with a fine "Expendables" skull and crow etching. The Hibben "Expendables 2" Toothpick includes a rugged leather belt sheath with a stamped Hibben logo and certificate of authenticity. Measures 17 1/2" overall. Excellent product. High quality knife in all ways! Very satisfied. Would recommend others who are interested in collecting and buying quality knives to consider purchasing one of these. This is my first Gil Hibben blade and I've never been so impressed with a knife for this price. Not only did the blad come sharp but everything on the knife was solid, no wiggle or play to be found. I highly recommend this to anyone looking to get their 1st or even 10th Hibben knife, for how solid the blade is you're getting more than what you're paying for. Thank you BUDK for the amazing customer service and quick shipment, you guys have gained a life long customer. First I would like to say this review in no way reflects on BudK. As for the knife, TOTALLY DISSAPOINTED! The Expendables logo (Inlaid synthetic ivory accent) that's on the handle is on the WRONG SIDE OF THE KNIFE (the side that is not visible when the knife is in it's sheath) and it doesn't sit flush in the handle. The Inlaid synthetic ivory accent should be on the side that puts the cutting edge away from you not towards you. I have tried to put the knife in the sheath backwards with the logo out but it doesn't sheathe properly and it puts the cutting edge forward instead of to the back as it should. (I believe the sheath is the issue not the logo. The belt loop and strap reversed would show the logo out with the cutting edge down instead of up) The first time I sheathed the knife, the brass perry guard came off INSIDE the sheath because it adds uncompensated thickness to the blade and was stuck to the point I had to use needle nose pliers to pull it out of the sheath and is no longer useable as it wont stay on the knife now. When I unsheathed the knife (with the perry guard stuck in the sheath) I found the perry guard was actually hiding a pit in the blade and the unpolished top edge of the blade. The top of the pommel wasn't buffed completely and still has grinding scratches still in it . Weight and feel, excellent, Quality, POOR and not worth the amount charged. Mr Hibben should be ashamed to put his name on a knife made this poorly. I mean really, Pits in the steal? I won't claim to be an expert, but this knife seems pretty good to me. Very sturdy and well made. 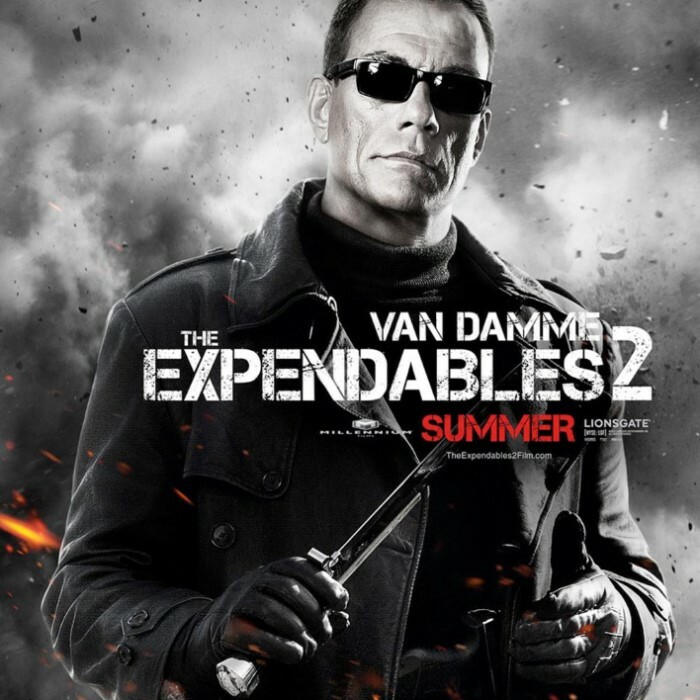 My only complaint is the Expendables logo that's on the handle is on the back side of the knife, the side that is not visible when the knife is in it's sheath, which is a bit of a bummer because the logo contributes to the whole memorabilia factor. I have tried to put the knife in the sheath backwards, thinking maybe it wouldn't matter, but it doesn't fit properly. When I bought this knife. I paid $100.00, the same Knife OLD WEST Tooth pick is $50.00 cheaper exact same knife OTHER THAN THE LOGO. when I asked for consideration I was denied. knife is missing the bottle opener near the tang that stalones version had in the movie. still a superb knife just not an exact replica. This knife is excellent! The only issue is with the sheath, it is too tight and does not allow the blade to slide freely into or out of it. Overall I am very happy with my purchase. First off, I have been a knife collector for most of my 55+ years, I know Quality from Crap. THIS is a quality, FROM the tip of the extremely sharp and pointed blade, as well as pointed. I display my knives on the walls of my home, and it will hold it's own with it's quality, beauty' it being a Gil Hibbon as well as being a knife designed for Sylvester Stallone's second Expendables movie. It will look awesome next to my Alamo Bowie, my Davie Crocket ect. Terrific toothpick! This is my first Gil Hibben knife and I was just blown away by the high quality of the knife and sheath. Sharp enough to cut you out of the box, Fit and finish of the knife and scabbard are EXCELLENT. Blade is a quarter-inch thick. Balance is excellent. As a US Army vet I can also tell you that this IS an effective combat knife if used in Fairbairn style knife fighting. Any stab will penetrate. This (and the old west toothpick) are NOT users. AUS-6 STEEL IS NOT A GOOD CHOICE FOR LARGE KNIVES SOMETIMES USED FOR CHOPPING. I KNOW IT SHOWS CHOPPING IN THE VIDEO, BUT NOT THE CONDITION OF THE BLADE AFTERWARD THE ANGLE OF THE EDGE GRIND IS TO ACUTE ( TOO SHARP) AT WILL CHIP OFF LITTLE CHUNKS. AUS-8 (HARDER) WOULD SERVE BETTER FOR A LARGE KNIFE. I CAN ALSO TELL FROM THE WAY IT TAKES TO A HONING STEEL, THAT IT WON'T HOLD AN EDGE FOR THE SAME REASON. THE HANDEL IS WAYYYY TO BIG, AND THE SHEATH IS 1/8" TO SHORT, AND TO THIN. THE BRASS PERRY GARD ADDS THICKNESS AND IT IS NEARLY IMPOSSIBLE TO GET THE KNIFE IN AND OUT. THE HOLD DOWN STRAP IS 1/2 TO SHORT AND WON'T SNAP. THE 'OLD WEST' IS NO LONGER AVAILABLE AND I CAN SEE WHY. LOOKS NICE, BUT THE WRONG STEEL, BAD BALANCE, MEGA LARGE HANDLE, MAKE IT USELESS IN THE FIELD....LOOKS NICE THOUGH !!! EVERY ONE ELSE'S REVIEWS ARE BASED ON LOOKS ALONE ! !